The Library has been endeavored in the promotion of interdisciplinary learning in support of the DEC Curriculum of the University. 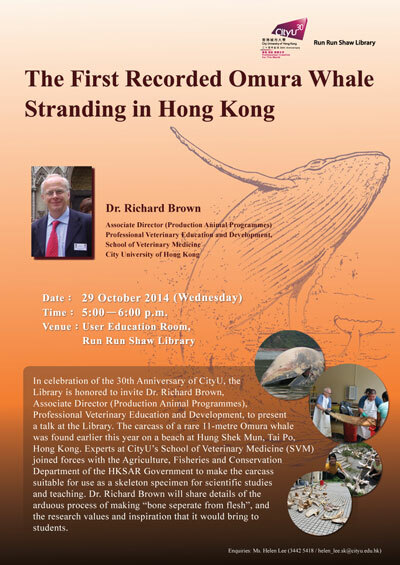 In celebration of the 30th Anniversary of CityU, the Library was honored to invite Dr. Richard Brown, Associate Director (Production Animal Programmes) in Life Sciences Programmes of School of Veterinary Medicine (SVM), to present a talk at the Library on 29 Oct 2014. The carcass of a rare 11-metre Omura whale was found in 2014 on a beach at Hung Shek Mun, Tai Po, Hong Kong. Experts at CityU’s SVM joined forces with the Agriculture, Fisheries and Conservation Department of the HKSAR Government to make the carcass suitable for use as a skeleton specimen for scientific studies and teaching. At the talk, Dr. Richard Brown shared details of the arduous process of making “bone separate from flesh”, and the research values and inspiration that it would bring to students. The establishment of SVM is a milestone in the development of CityU and the Library was honored to have the opportunity to introduce the achievement of this newly established school to CityU community.